Beyond the Divine Liturgy and the sacred Mysteries, there are other services of the Orthodox Church, whose frequency varies from community to community. These include the daily Hours of prayer which were born out of the desert monasteries and were eventually incorporated into the life of the urban parishes and Christian homes. The daily cycle, if served completely, would include a service at least once every three hours. Christians have historically greeted the setting sun with hymns to Christ, the Giver of the never-waning Light. Harking back to the Hebrew heritage of the Church, the liturgical day begins at sunset, so the new day begins with the service of Vespers. This evening service includes the chanting of Psalms, hymns proper to the day and season, prayers; it will also include readings if it is a special Feast day. While Vespers may be served any day of the week, it is served with special grandeur on the eve of a Feast. Prayed before retiring for the evening, Compline has two forms: Small Compline, which is served throughout most of the year, and Great Compline, a much expanded version served during Lent, the forty-day period preceding the celebration of Jesus Christ’s resurrection from the dead. Various services may be included within the context of Compline: the two most common are the Paraklesis—the service of Supplication asking for help from the Mother of God; and the Akathistos—a service of praise to the Mother of God. This penitential service focuses on the Second Coming of Jesus Christ which will come, in His own words, unexpectedly—like a thief in the night. Thus, the theme of this service is repentance and readiness for Christ’s coming to judge all the world. These much briefer services—often prayed one immediately after the other in order to allow for other responsibilities even in monasteries—contain a few Psalms, a couple of hymns proper to the day, and brief prayers. Their times correspond both to ancient patterns of prayer as found in the Scriptures, but also to significant events. They have expanded forms during Lent. First Hour - Prayer around 6am; corresponds to the time of Jesus Christ’s judgment before Pontius Pilate, the Roman governor of Judaea. Third Hour - Prayer around 9am; corresponds to the time of the Holy Spirit’s descent upon the Apostles at Pentecost. Sixth Hour - Prayer at noon; corresponds to the time of Jesus Christ’s Crucifixion. 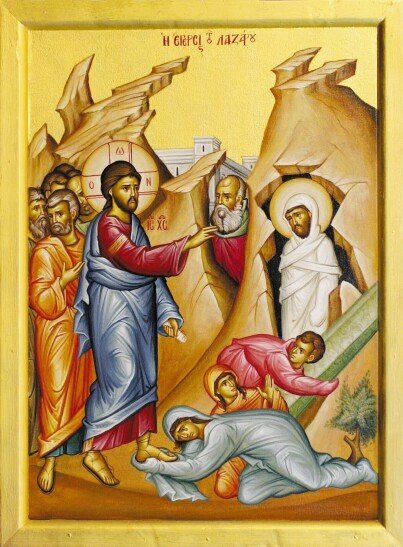 Another brief service, called the Typika, is often appended to the Sixth Hour—it contains some Psalms and the Beatitudes (Matthew 5:3–12). Ninth Hour - Prayer around 3pm; corresponds to the time of Jesus Christ’s death on the Cross.